The Hardrock 100 reverses direction every other running. This year, the race is being run in the clockwise direction. Regardless of the course’s direction, the climb over Virginius is one of the cruxes of the Hardrock 100. Veteran Hardrock 100 runners describe their experiences with Virginius in Part 4 of Evan Honeyfield’s Voices of Hardrock video series. Betsy Kalmeyer: Virginius is about the space of a coffee table, really, and you have to crawl up a scree field on one side and crawl down a scree field on the other side. Usually, the one scree field facing Ouray is totally snow covered and by the time you get up there you’re pretty exhausted. Those guys are special. They’re up there trying to help you, trying to get something warm in you in the middle of the night. Roch Horton is always trying to get tequila in you, whether it’s the runner or the pacer. Roch Horton: So what I’m planning to do with this aid station, I’m pretty convinced as you can tell, this is kind of my baby, so I’m going to make it the alumni aid station. It’s where old Hardrockers go to die. They can join my crew up there, and they can watch their old Hardrock buddies come through in the middle of the night or the middle of the day and help them out and give something back. We’ve got the best perch, the best viewpoint. It’s certainly the ticket to seeing the race in a different perspective. 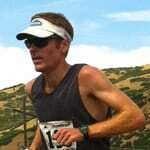 Evan Honeyfield , a former and hopefully future ultrarunner lives in the high desert of Idaho and recently had LASIK. He carries his gel in UltrAspire gear, his sole sponsor. He learned about compassion and empathy in 2012 and is hoping to see the world clearer in 2013.